Royal Bank of Scotland chief executive Ross McEwan’s defence of 62 branch closures across Scotland, including Duns and Eyemouth, was described as “pathetic” by Borders MP John Lamont. Mr McEwan was giving evidence before the Scottish Affairs Committee this week after being ordered to appear before them. 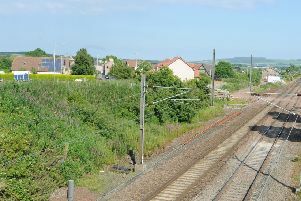 During the session, Mr McEwan promised the bank would visit more locations with a mobile bank service, despite having just withdrawn or reduced mobile bank services for Coldstream, Paxton, Allanton, Foulden, Chirnside, Ayton, Leitholm, Swinton, Lauder and St Boswells. The RBS chief agreed to follow up on concerns raised by residents who will lose their mobile service, as well as the experience of one disabled resident in Eyemouth who had to do their mobile banking in the pouring rain in a car park. Berwickshire, Roxburgh and Selkirk MP, John Lamont, said: “RBS claim that customers are not concerned about these closures and that most are happy to use other branches, or mobile or internet banking. The comments by Ross McEwan and senior figures at the bank showed a complete lack of understanding about the impact losing a bank will have on rural communities. “They seem to think people are happy to lose their branch and appeared completely unaware that its customers in the Borders are angry at losing their mobile van or the problems disabled customers have in accessing mobile branches. “Despite the bank’s warm words, the reality on the ground is somewhat different and harsher for communities who are losing bank branches and mobile banking services. RBS have come to the Scottish Affairs Committee to say one thing and do the complete opposite in communities. “The truth is that residents feel angry and feel betrayed by the bank they saved, as taxpayers, just a few years ago. McEwan told MPs he recognised that customers were angry about branch closures but they were commercially necessary and the decision had not been taken lightly, adding that after this phase of reductions, that part of the business would not be looked at again until 2020.